Note: Please note that the page data is correct for a one-way trek from the WNW trailhead to the ESE trailhead. Description below describes starting from the ESE, adjust data accordingly to your adventure when posting triplogs. This is a rather short trail, but it is very pretty. The trail crosses Willow Canyon (Willow Valley on the topo map), which flows into West Clear Creek about five miles downstream. I don't think there is an actual trailhead for this hike on the southern end, at least we didn't see one, anyway. My buddy John just kept driving, through a gate, past many a cow, until a fallen ponderosa blocked the road, which is about where the forest service and topo maps show road 122A ending. We parked a short ways down a grassy drainage with many ponderosas. The trail continues down the west side of the drainage and wades through thorny locust bushes, gradually getting steeper until you find yourself on a short, steep ridge. The trail descends this ridge, offering some nice views of Willow Canyon, and passing some douglas fir and gamble oak trees. You will soon reach the bottom of the canyon (beware of some poison ivy the last few hundred feet). 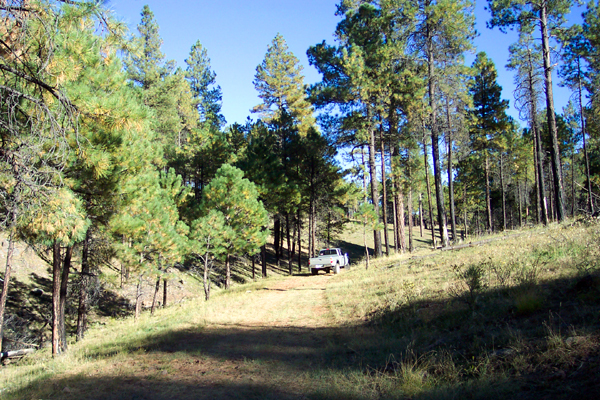 There is a small camping area beneath some ponderosas and firs. 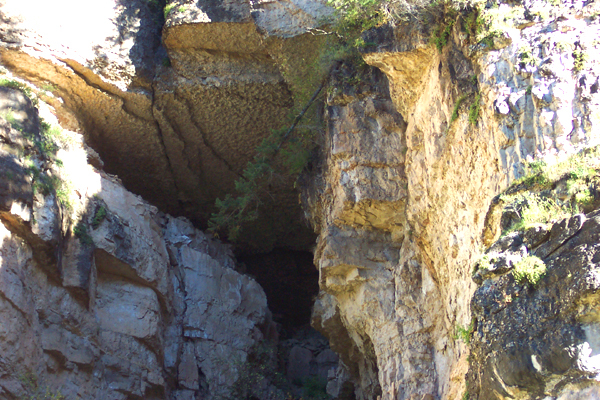 Directly above you on the north canyon wall, is the main attraction of this hike (for me anyway): a natural rock arch. 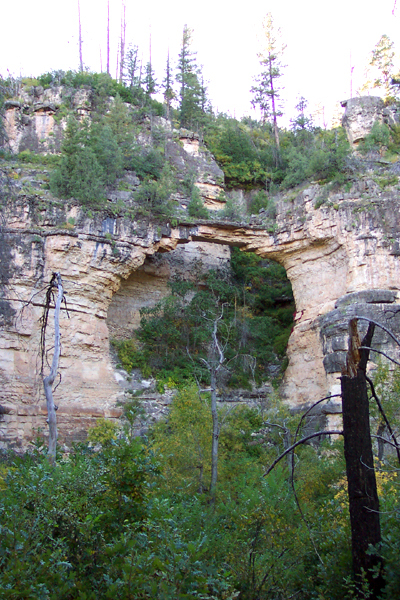 The arch is about fifty feet high, worn away from the Kaibab Limestone cliff. We lingered in the bottom of Willow Canyon for a while, and hiked downstream maybe a quarter mile. A short ways down canyon we saw a cave or alcove about a hundred feet up the cliff on the south canyon wall. It would have made a nice spot for a cliff dwelling. It was late September when we did this hike, and there was some fall color in the canyon, mostly golden box-elder trees. 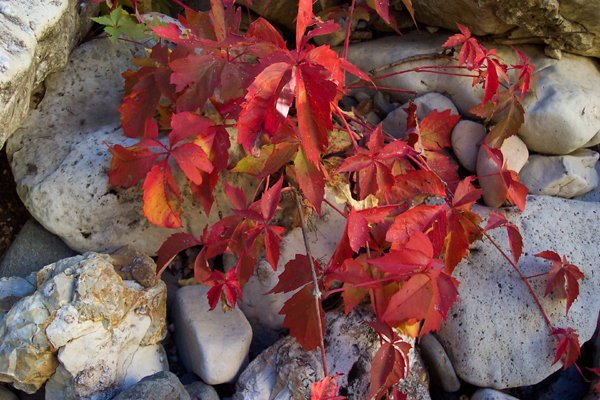 We also saw a bright red virginia creeper vine. From where the trail reaches the bottom of the canyon, it continues on upstream past the campsite and arch, and climbs the north canyon wall, a short distance east of the arch. From there it was about a mile to forest service road 9366m, where the trail ended. We returned the way we came in. Coconino FS Reports The trail starts at the end of FR 122A in a parklike setting of mature ponderosa pine. The trail heads northwest following the west side of a small drainage before descending into Willow Valley. Vegetation found along this stretch of trail includes ponderosa pine, locust, and Gamble oak. Once in the drainage of Willow Valley, the vegetation consists of more riparian species, including poison ivy. Learn to identify this three-leaved plant. Other riparian plants in the drainage include wild grape and willow. 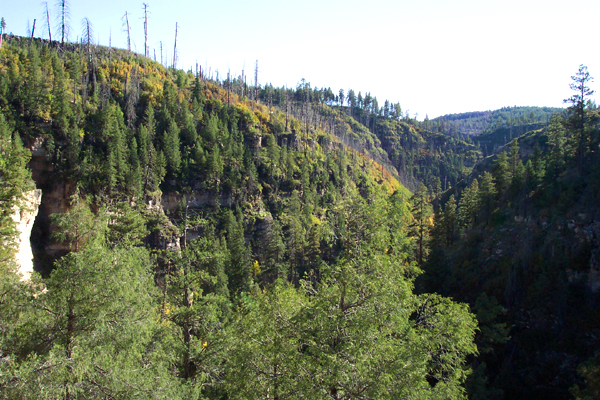 The rugged canyon of Willow Valley provides the required habitat for many species of wildlife, including the reclusive black bear. Look for signs of black bear activity such as torn-apart logs and overturned rocks. The trail climbs gradually out of the canyon through an area of ponderosa pine and follows along the south side of a fence line to the trailhead on FR 9366M. Watch for the rock cairns that mark the trail through this stretch. Access (south trailhead): From Clints Well (junction of Arizona State Route 87 and the Forest Highway 3) drive north on FH-3 approximately 4 miles to FR 196. Turn left (west) and proceed approximately 2 miles to FR 122A. Follow 122A to the trailhead at the roads end. Be sure to re-close the gate by Pecks Point Tank. Access (north trailhead) : From Happy Jack Ranger Station, follow Forest Highway 3 (Lake Mary Road) south 7.5 miles to Forest Road (FR) 81. Go right (west) on FR 81 and continue for approximately 5 miles to the FR 9366M. Go 0.3 mile to the traihead which is located on the left. High clearance vehicles are recommended and the road may not be passable during wet weather.